The performance of your HVAC system can be difficult to monitor with the naked eye. Traditional tools are also complicated for Do It Yourself lovers. That’s why a simple, compact device is needed to help monitor your building or home and help identify necessary repairs that need to be made. Seek Thermal products enable you to see the different aspects of a system from energy loss to electrical shorts, missing insulation, air leaks, or even a failing motor. The Seek line has a series of products including the Seek CompactPRO which we’ll be looking at today, the Compact XR, and the Seek Compact. The Seek CompactPRO can be used in almost every commercial setting that needs the taking of thermal readings in a building or construction site. The CompactPro can be used for spotting overheating motors, identifying unbalanced loads on electrical circuits, finding lose connections and many more. 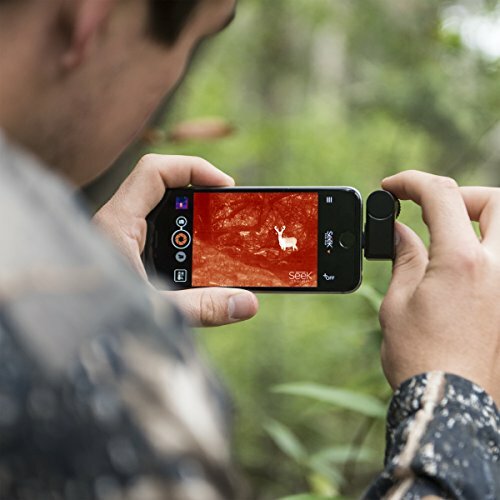 Users have also found great usage as a hunting companion when picking out targets in challenging backgrounds although this is not its main use. 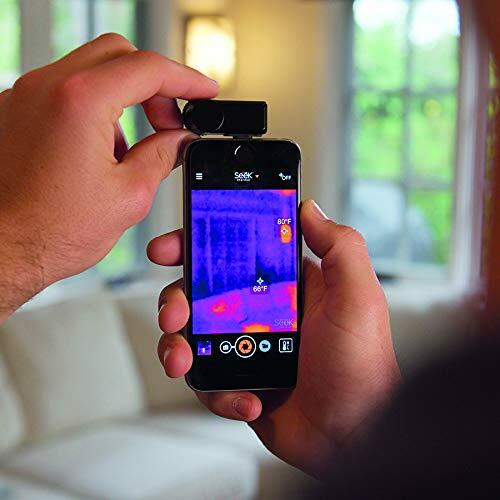 Seek CompactPRO is a thermal camera that attaches directly to your smartphone. 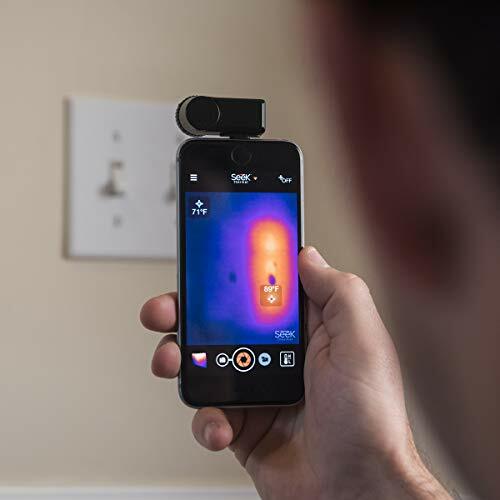 It gives you thermal images directly on your iOS or Android smartphone. This unit is a direct successor of the Compact XR. It boasts high resolution, fastframe, auto-calibration, wide temperature range, emissivity settings, a wide field of view, and a long distance range. For such a compact product, the Seek CompactPRO features 320 x 240 resolution. It has 76,800 pixels which can capture temperatures. It offers high thermal sensitivity and maximum clarity images. It is powered by 15Hz frame rate which is reasonably fast. Videos and images captured on the Seek CompactPRO can be stored directly on your smartphone. It allows quick and simple posting of pictures. With the new Seek Mobile APP, you can also take radiometric JPEG images. Users get to choose between 4:3 and 16:9 formats according to your phone or tablet format and size. This helps in displaying of high-clarity temperature data. Most advanced cameras come with a focus-free lens, but the CompactPRO allows you to focus the lens so that you can choose the right imaging area. With a focusable lens, you can take thermal images from as close as 6 inches or as far as 1800 ft away. This device gives the user more control over the imaging process. Surfaces emit thermal radiation in different ways. With the CompactPRO you can adjust emissivity settings to account for these differences. Emissivity affects the amount of energy that objects emit which in turn influences a thermal camera’s temperature calculation. A temperature reading that reflects correctly regarding the energy it emits has an emissivity of 1. The CompactPRO allows you to match an object with its emissivity for a more precise temperature reading. You can highlight the focus of this camera by adjusting the level and span. This is in terms of adjusting minimum and maximum temperature change. This way, you can eliminate and reduce unwarranted distractions. It gives you better precision than if you were just using a low-end thermal camera. The CompactPRO does not really have a learning curve when it comes to taking pictures. You will need to set the focus correctly using the rotary knob. This allows capturing of images efficiently since you’ll be able to spot the margins of the object you intend to obtain. You’ll notice the high resolution as it lets you see tiny details much better. It displays pictures with smooth edges and less distortion as opposed to devices with a lower resolution. It has a wide selection of color palettes for every purpose. The quality of videos is also admirable. It has a 15Hz frame rate. You can record videos according to the orientation of your phone. Whether it’s in landscape or portrait, the app turns with the way you rotate your phone. One of the major attractions of the Seek CompactPRO is the small size. It is a perfect pick for beginners who are not looking to invest in a full-size camera as they begin the trade. It can fit in your pocket where it will be ready for use at a moment’s notice. Professionals will also love it when handling small projects that don’t need a heavy thermal camera. Seek Pro uses the battery power on your smartphone. It could be a drawback if the device drains the power as soon as you plug it in, but CompactPRO has been engineered to use the least energy possible. It even meets Apple’s strict standards on low energy consumption. This device is only 0.5 ounces. It comes with a shock and waterproof protective case that allows the user to take it wherever you’d like no matter the ground and the weather. Although the CompactPRO is a small unit, it has a substantial field of view at 32 degrees vertical and 24 degrees horizontal. It is pretty good as it fits most demanding applications in the professional world. It provides you with a vast viewing area where you don’t need to keep on zooming in on the image. You’ll also do not need to move the camera constantly. This helps you spot potential dangers in seconds. The CompactPRO has temperature measurement range from -40° F to 626° F. It gets you into different environments from taking measurements in subzero temperatures to inspecting machines over 600° F.
It combines a wide temperature range with high sensitivity, standing at 0.07 C. It is no wonder many professionals and savvy homeowners see it as an equal to other high-end cameras! Seek has a free Mobile App available for download in Google and iTunes stores. It has an intuitive design which adds essential features for the professional user. It maximizes your phone’s power so that you can get the most out of this software. It helps you to control High/Low Temperature, Spot temperature, Above Threshold, Below Threshold, Equal Threshold, Level and Span, and Thermal + Visible. Users will have an easy method of examining data by the visual capabilities of the Seek CompactPRO. This feature allows users to select and lock a temperature range when you want it to display every thermal detail of a scene or object. Now you can capture the details that matter. Seek is pushing the limits in the world of thermal imagery. Three of its models have successfully been on the market offering users an easy time with a compact and portable infrared camera. The Seek Compact and Compact XR both share a resolution at 206 x 156 pixels. They can detect and capture thermal images but not with the clarity showcased by the CompactPRO which has the highest resolution at 320 x 240 pixels. The Compact and Compact XR also have an auto emissivity while emissivity is adjustable for the CompactPRO. The two devices also have an auto mode only, while the CompactPRO has Auto & Span/Level control. The main difference between the Compact and Compact XR is the detection range which stands at 1000ft for the former and 1800ft for the latter. This is where Seek draws the line between the two models. From what we can deduce, the CompactPRO is obviously the most advanced of the three models, yet it is tailored at a very reasonable price. ​Monitor Utility Components: Users can quickly identify plumbing and HVAC issues with the CompactPRO. If you like doing it yourself, the device is straightforward to use. It allows homeowners to undertake preventive maintenance. Find lost persons or animals: This thermal camera can easily pick up on body heat. It allows the user to track a person in thick vegetation or wooded areas. Hunters also use it to know the location of an animal that could be lurking dangerously around their home. The CompactPRO does not have an inbuilt visible light camera. As such, it will not capture details that can help identify the location of a problem without using a reference picture. It’s pleasing that it has a high thermal sensitivity which can identify the smallest temperature differentials when locating an issue. It’s not easy to adjust the focus lens: The focus lens can be time-consuming to use. Although it provides more accuracy, you might prefer a focus-free lens if it’s going to slow down your inspections. Autocalibration is a bit disruptive: When making video recordings, the camera manifests continuous calibration which is indicated by a distance internal shutter every 2 seconds. It causes the image to flicker which may distract you.However, the flickering goes away after recording for some time. The CompactPRO is a palm-sized device but with the features of a high-end thermal imaging camera. It is an advanced model seeing that has the highest resolution, frame rate, and detectable range in the Seek line. It also has multiple controls and emissivity is adjustable. The lightweight and compact design make it an easy tool to take to projects where carrying a large thermal camera would be too much on your hands. It connects directly to your Android or iOS Smartphone. The Mobile App is quite intuitive, and we believe if you are looking for an affordable thermal camera, the Seek CompactPRO is a great choice. It made it to our Best Cheap Thermal Cameras in recent comparison.